This wonderful Moroccan dish is very lightly spiced. For an alternative flavour, use raisins instead of apricots. Heat the oil in a large, heavy based saucepan. Cook the shallots for 3-4 minutes and then add the lamb steaks. Stir and cook for 5 minutes or until the meat is sealed. Add the saffron, ginger and chicken stock and bring to the boil. Cover tightly, and simmer gently for 1 hour. 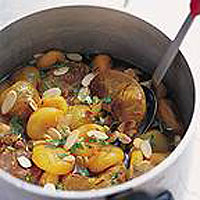 Add the apricots and cinnamon, season and cook for 5-10 minutes or until the meat is tender. Garnish with almonds and chopped coriander and serve with Waitrose Couscous (from the deli counter) and tzatziki. New Zealand chilled lamb leg steaks would also be ideal diced for the Arabian dish Laban Immo, in which the lamb is marinated in herbs, spices and yogurt and then quickly grilled or barbecued.